How to measure the redshift of a galaxy ? Type I : which show both narrow lines (forbidden lines of a very dilute medium located at the periphery of the galaxy) and broad lines (allowed lines located in the fast-rotating accretion disk), the high speed of rotation of the accretion disk which can be very important up to 10 000 km/s. Type II : which show only narrow lines prohibited because of the line of sight masking the center of the galaxy. 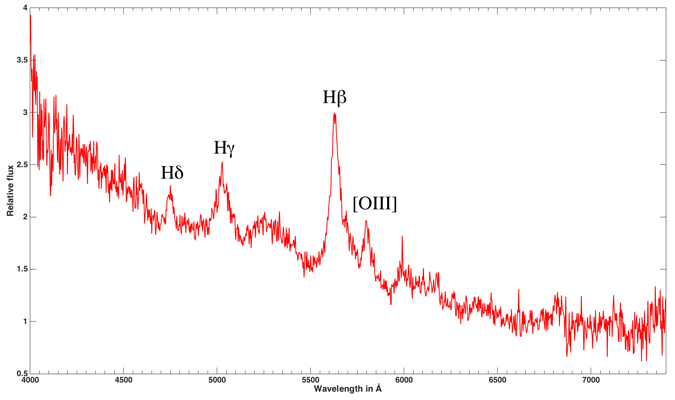 The spectrum thus shows only the emission lines located on the periphery of the galaxy. For acquisitions, we will put the center of the galaxy in the slit of the spectroscope. Autoguiding can be done on a star close to the galaxy. According to your own setup, it will be necessary to take about 1 to 2 hours exposures, may be more, by dividing the total exposure time in increments of 600 to 1200 seconds depending on the magnitude of the target. On a single exposure we obtain a spectrum similar to the one below. Once you have process the spectrum with software like Demetra, ISIS or Vspec, it must look like the one below (case of a galaxy with a redshift z = 0.06). The noise level of the spectrum depends on the total exposure time on the target. 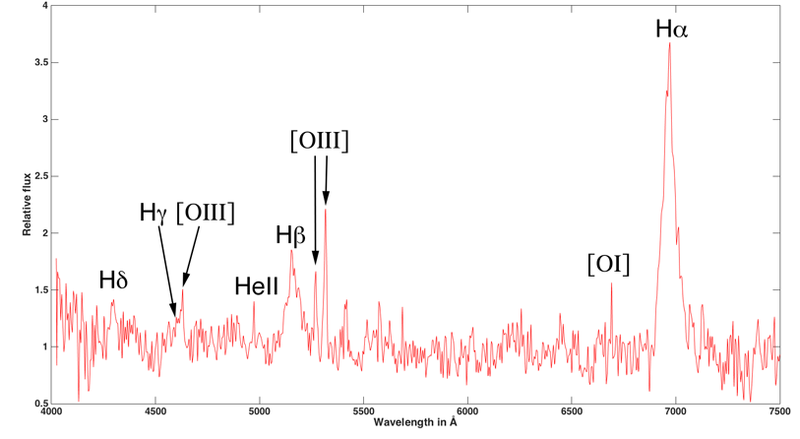 We obtain a spectrum strongly shifted in the red with easily identifiable lines and very broad Balmer lines : H Alpha line is thus shifted to red at 6970 Å while its value “at rest” is 6563 Å. The measurement of the full width at half maximum (FWHM) of this same line showthe rotational velocity of the accretion disk of the galaxy about 2560 km/s. The mass of the black hole could be calculated provided that the distance of the accretion disk from the black hole is known. With c, the speed of light in km/s, Δλ the width of the line in Ångström and λ the nominal wavelength of the line (for example Hα = 6562,82 Å). • Wide hydrogen lines of the Balmer series (Hα, Hβ, Hγ and Hδ) which correspond to the matter of the accretion disk in rapid rotation around the black hole, a dense region where only permited lines can exist. Measuring the FWHM of these lines (see calculation above) makes it possible to calculate the rotational velocity of this disc, more wider is the line, greater is the rotational velocity. • Narrows lines all forbidden such as the lines, [OI] and [OIII] which are present in the galaxy but not in the accretion disk. (Their width indicates that they do not have the same speed). 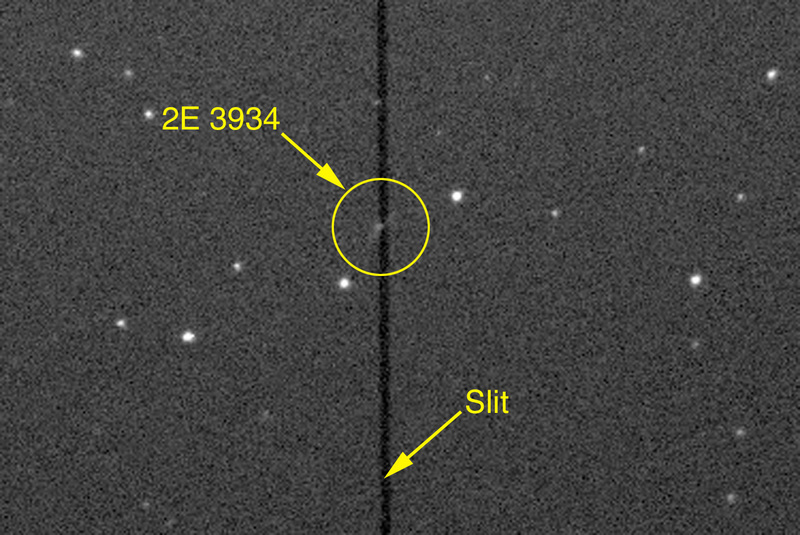 With c = 299 792.458 km/s, λ1 measured value of each line, λ0 value “at rest” of the line. The calculated velocity is therefore in km/s. The term of the equation just after c is in fact the redshift factor z. (the simplified equation is Vr = c, z). 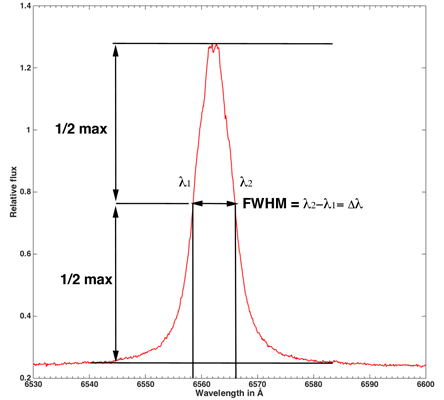 With the Hubble constant, one of the last known value: H0 = 73.02 Mpc. This table summarizes the measurements made on each line where, at the end, all the measurements are averaged. 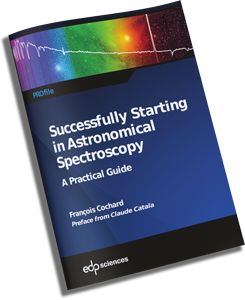 The uncertainty of the measurements can be calculated according to the resolution of the spectrograph used (from 30 to 200 km/s depending to whether it is a Star Analyzer, an Alpy or a Lisa). In the presented case, the calculated redshift is z = 0.061 (SIMBAD also indicates a z = 0.061),so we can calculate a very precise redshift on this kind of distant galaxies with a low resolution spectrograph low where the shift is consequent. 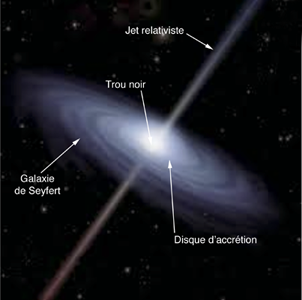 On peut réaliser la même expérience sur des quasars ou blazars beaucoup plus lointains mais il sera plus difficile d’identifier les raies car le décalage dans le rouge sera tellement important que la raie H alpha va «disparaitre» du domaine visible du spectre. Le graphe ci dessus monte le spectre du quasar 3C273 avec z=0,158.